Adult learners studying to earn a high school equivalency diploma through YWCA Tri-County Area received a boost today from the members of the Delta Sigma Theta Sorority’s Valley Forge Alumnae Chapter. Christi Hilliard (left) and Tracey Howard (right) present a donation check to Veronica Barna, director of YWCA Tri-County Area’s Education and Training Center. 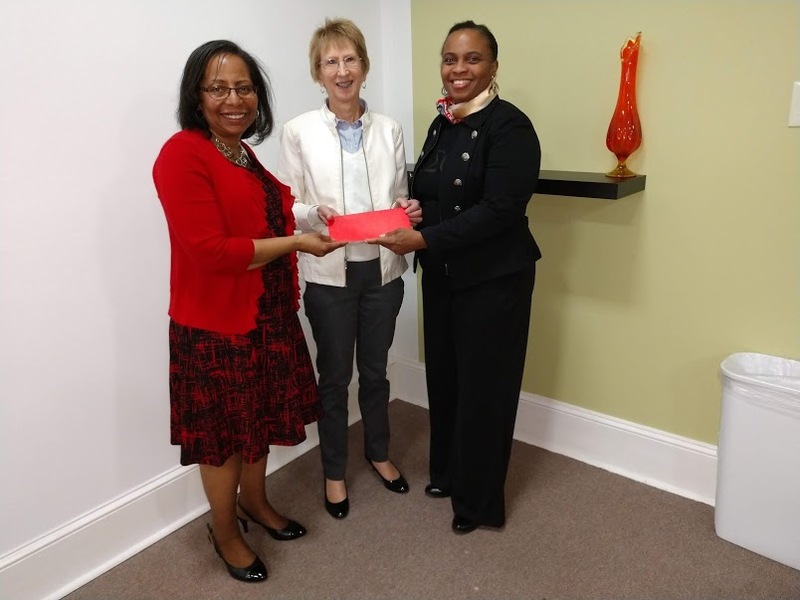 Members of the Valley Forge Alumnae Chapter donated to YW’s Education and Training Center, which works with adult learners as they improve basic skills toward a high school equivalency diploma and prepare for the workplace. New residents to the United States improve their ability to speak, read, write, and converse in English through English as a Second Language classes; new residents interested in becoming U.S. citizens can receive guidance and support as they progress through the citizenship process. More than 140 adult learners attend classes to improve their educational skills and qualify for additional career training or education. YW offers a full-service adult education program, including Adult Basic Education, High School Equivalency preparation and testing, and English as a Second Language. Classes take place in Pottstown and Norristown. YWCA Tri-County Area is dedicated to eliminating racism, empowering women and promoting peace, justice, freedom and dignity for all. YW is a leader in women and girls’ advocacy and works to eliminate racism and empower women through quality affordable early childhood education, adult education, youth empowerment, and a host of programs to support the health and vitality of women, girls, and families.